I Love You Messages for Sister: When was the last time you gave your sister a hug to say Thank You for every time she has been there for you? It doesn’t take a lot. Scribble out a few cute quotes on a greeting card, post sweet messages on her Facebook or share something funny with her on Pinterest – don’t take your sister’s love for granted. You’ll realize the importance of this precious bond only in hindsight, when it is probably too late. Whether you are an older brother to a little sis or a younger bro to an elder sister – don’t wait for Sister’s Day to share an adorable sibling moment with your sis. Just walk up to her and catch her off guard. You both will probably break into giggles as she unwraps you little note. It’ll be a memory that you’ll hold close to your heart for a lifetime. 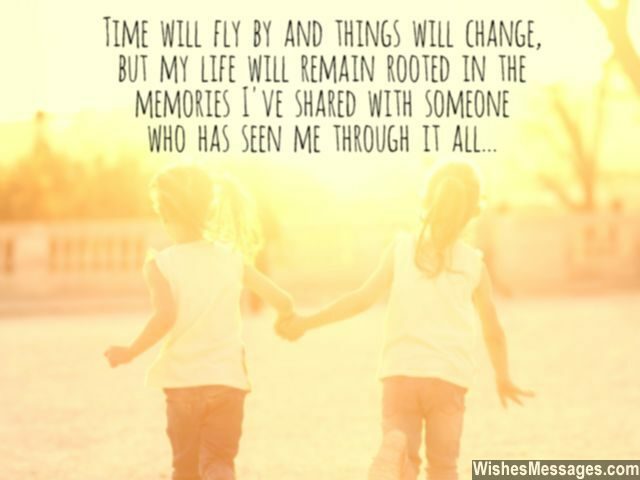 1) Time will fly by, things will change, but my life will remain rooted in the memories I’ve shared with someone who has seen me through it all. I love you sis. 2) Giggles and tears, smiles and frowns. Everything from dead serious, to goofing around. Life’s ups and downs, tornados and twisters… are totally bearable, when you have a sister. 3) Google’s biggest competitors are sisters like you who have answers to everyday stuff that are too complex for search engines to answer. I love you sis. 4) Best friends will listen to all your worries with their ears… but only a sister will listen to all your worries with her heart. I love you sis. 5) Whether young or old, whether poor or rich… I know that the only place in the world where I can get free and unlimited accommodation is in my sister’s heart. I love you. 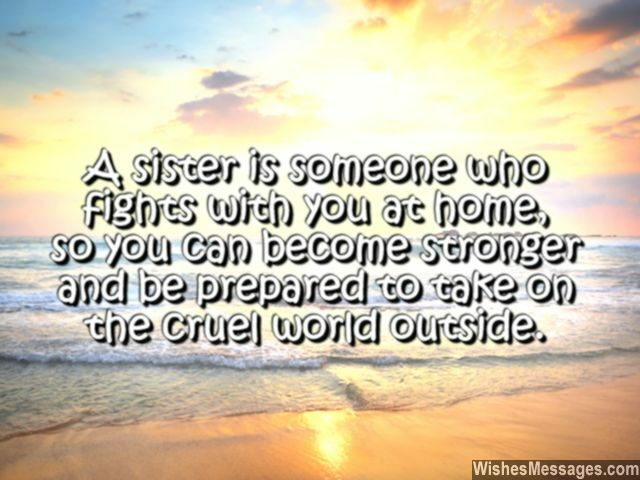 6) A sister is someone who fights with you at home, so you can become stronger and be prepared to take on the cruel world outside. I love you sis. 7) The most annoying thing about having an elder sister is that she never gives you advice in any particular way or at any particular time – she gives it to you all the time and in every possible ways. I still love you sis. 8) All these years I have spent with you has made me realize that a sister is a friend who knows all your secrets, but never judges you. I love you. 9) My sister is the person who claws me like a cat and then takes me back in her arms like a teddy bear. Love you sis. 10) As a sister, you play many roles in my life including a relationship counselor, fashion guru, makeup expert, money lender and parental advisory at the same time. I love you. 11) Fairies are real… I have one. She calls herself MY SISTER. I love you. 12) I have learnt that friends will scatter when you’re caught creating trouble. Only a sister will hug you and call your antics cute and adorable. I love you sis. 13) Whether you hug your sister like a bear or fight with her like a cat, she will always be there to swoop down and pinch you out of your troubles like an eagle. I love you sis. 14) When God gives you a sister, it means that He has sent an angel on deputation to watch over you. I love you sis. 15) Growing up with an elder sister is like taking shots on a practice pitch. She’ll pin you down for all the wrong shots you play each and every time… so that in real life, you can step out on the field like a rockstar. I love you sis. 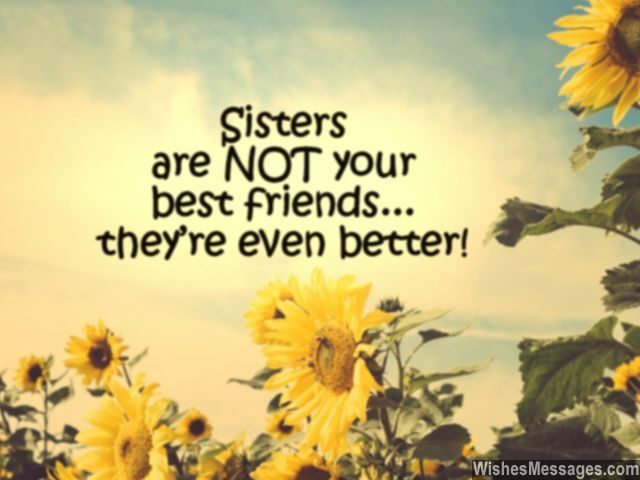 16) Sisters are not your best friends… they’re even better. 17) A sister is like Santa Claus. The only difference is that she actually knows what you want for Christmas. I love you. 18) Sisters are the only people in the world who can hate each other endlessly… and still be fine with it because their love for each other overpowers their hate. I love you. 19) Dear sister, you are the only person in the whole world who knows me better than I know myself. I love you. 20) Textbooks, manuals, diagrams, guides, tutorials, procedures, flow charts, journals, references – do you know what all of these have in common? They can never teach me the life experience that a sister like you can. I love you sis. 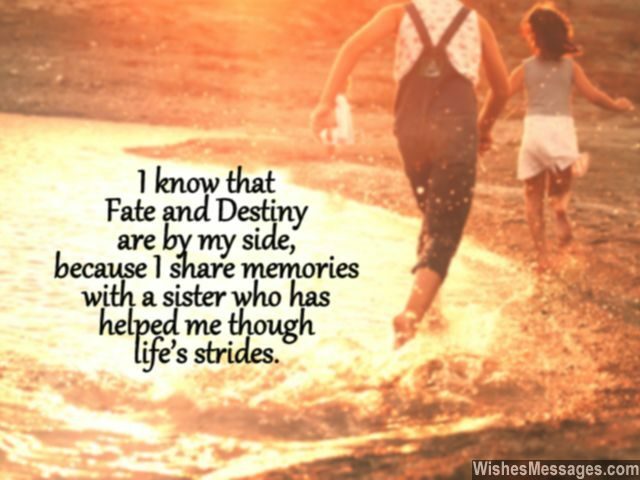 21) I know that Fate and Destiny are by my side, because I share memories with a sister who has helped me though life’s strides. Love ya. 22) As much as sisters can tell on each other, they can also keep the darkest of secrets. I love you. 23) Sisters are almost a reflection of their brothers, except that they are way more mature. Love ya sis. 24) I can choose my friends and I can choose the people I go out with. But I never had the chance to choose my sister, and that is one choice I am glad I never had – because you are the best sis anyone could ever have. I love you. 25) Growing up with a sister can seem like living a nightmare, only until you’re older and realize that it was nothing less than a dream all along. I fight with you sis, but deep down inside I have nothing but love for you. 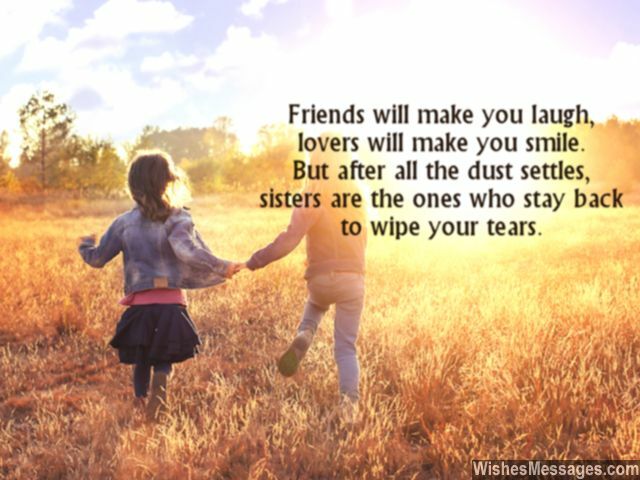 26) Friends make you laugh and lovers make you smile. But after all the dust settles, sisters are the ones who stay back to wipe your tears. I love you sis. 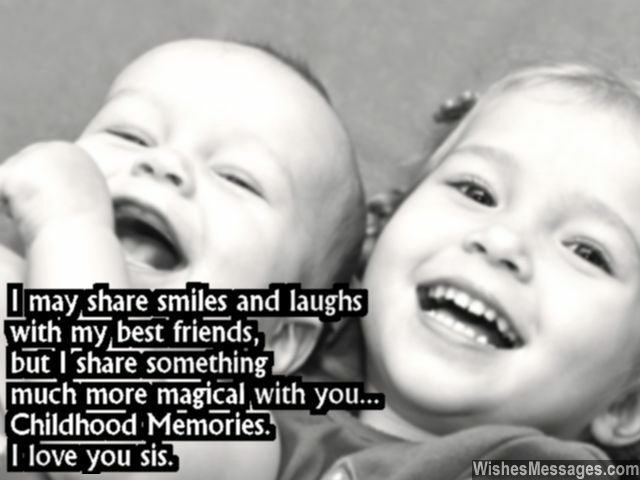 27) Sisters are to life what salt is to food, water is to fish and night is to stars – irreplaceable. I love you. 28) Sisters are like the default files installed in a computer. They are vital for the system of life to run smoothly without any errors or crashes. I love you. 29) A sister is that person who knows all your secrets, fears, bad habits and just about everything else there is to know about you. She can make you dance like a puppet at will. Yet, all you will get from her are warm hugs that make you feel as if you were the most important person in the world. Thanks for being that person sis, I love you. 30) Sisters catch you with advice and hugs, when life pushes you into doing something you don’t want to do. I love you. 31) I may share smiles and laughs with my best friends, but I share something much more magical with you… childhood memories. I love you sis. 32) You make fun of me and tease me all day long. But deep down inside I know that it is your way of teaching your little brother how to be thick skinned and take on the outside world. I love you. 33) Before a brother starts arguing with his sister, he must always remember that she is never wrong – this is what I have learnt from spending so many years with you sis. I love you. 34) Sis, as I grow up a lot of things will change except one… my love for you. 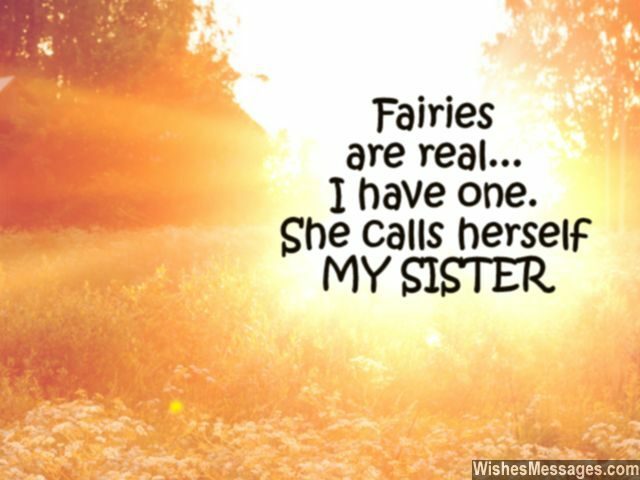 35) The best part about having a sister like you is that you always have someone to pass on the blame to. Jokes aside, I love you sis… you’re the best. 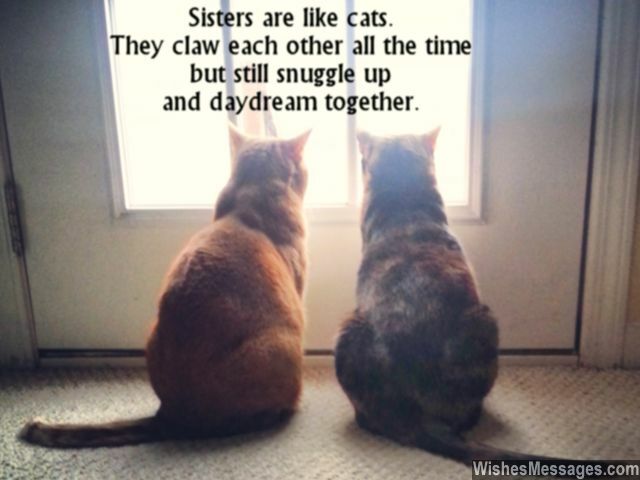 36) Sisters are like cats. They claw each other all the time but still snuggle up and daydream together. I love you sis. 37) Competing with a sister is better than competing with other people because even if you lose, she showers you with hugs instead of insults. I love you. 38) I love you despite the fact that you fight with me day and night. After all, it is you who unites with me to ask dad to increase our allowances. I love you. 39) Sis, whenever you feel that your heart isn’t with you, check up with me because I am its guardian. I love you. 40) Many people have told me that I look like my sister, to which I’ve replied ‘I’m glad I do’. Sis, I love you.